A year longer than it took to finish college. Twice as long as it took to get a visa to live in another country. I can't believe it. While I can't hardly remember a time where I didn't share a bed, brushed my teeth solo, or took out the garbage myself, I don't know how five years of marriage have already passed by. "Where did the time go?" I ask myself. 5 homes, a fur-baby, a giant move all the way up to Vancouver, gaining permanent residence in another country, career changes for both of us, another Bachelor's degree for Brett and book deal for me, the purchase of our first home, and the arrival of our baby boy. No wonder we are exhausted, lol. No wonder we have never been happier. In honour of the milestone, I wanted to make something decadent and dramatic. Obviously chocolatey. Since it's cherry season, I decided on a Black Forest Cake. 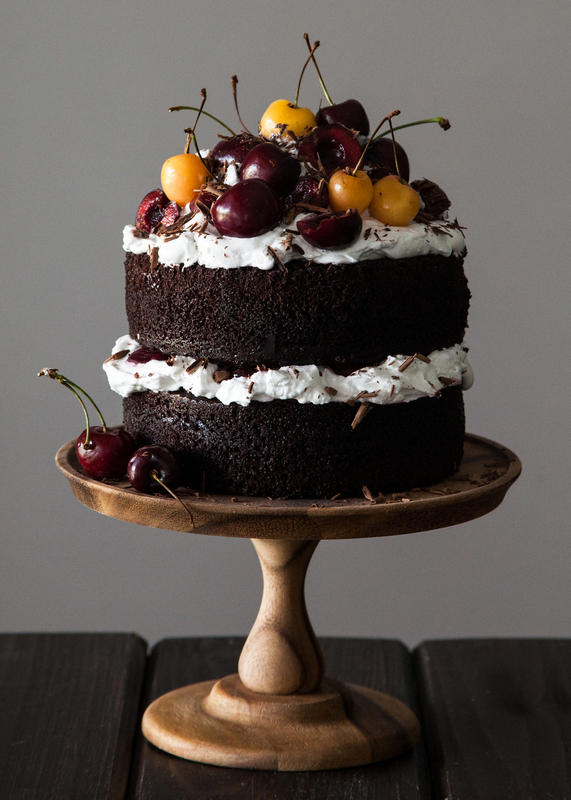 I have an entirely different take on Black Forest Cake in my book, but until then, there is this towering beauty. Two moist layers of classic chocolate cake smothered with fluffy 7-minute frosting were layered with candied cherries, fresh cherries, and a blanket of chocolate shavings. Instead of the traditional kirsch (cherry liqueur) and freshly whipped cream, I used spiced rum and marshmallowy meringue frosting. Rainer cherries are by far one of my favorite fruits, so I threw some of those in the mix as well. For the Chocolate Cake, I used half of this recipe of mine. It's classic in flavor and moist in texture - an all-around delicious yet versatile chocolate cake. To be honest, I used half the batter to bake two 6-inch rounds cakes (26 to 30 minutes at 350 degrees) and the other half to make a dozen cupcakes (22 to 24 mints at 350 degrees) that are wrapped up tight, awaiting their destiny in my freezer. I used this simple recipe from Smitten Kitchen for the 7-minute frosting. It is light, silky smooth, and has a real vanilla taste. I quickly candied the cherries by throwing in about 2 cups of halved and pitted cherries in a saucepan with 3 tablespoons spiced dark rum and 3 tablespoons sugar. After bringing the juices to a boil, I lowered the heat and let the cherries soften a bit (about 8 to 10 minutes). Be sure to drain the cherries first with a mesh sieve over a mixing bowl (saving the liquids) then on a wire rack lined with a paper towel. Use the leftover rum-cherry juice to brush on the chocolate cake layers before assembly. For the chocolate shavings, simply take a vegetable peeler to a piece of chocolate and shave directly over the cake - letting the shavings fall as they will, like snow. Cheers to another 5 years and a lifetime of cuddles, kiddos, and chocolate cake!